Our Dyno-Jet is now finished and has been officially launched! The motor and pump is from a 1988 650SX Kawasaki Jet-Ski - one of the stand up types. It is a 650cc engine and should produce about 50 HP. 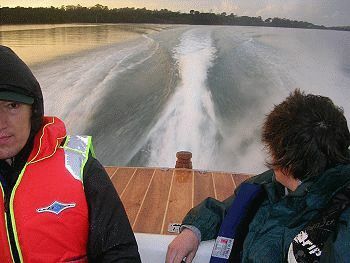 The boat reaches a speed of 35mph with one person on board and is a real hoot to drive fast up smaller twisting rivers. We have also towed two big kids on kneeboards with it. 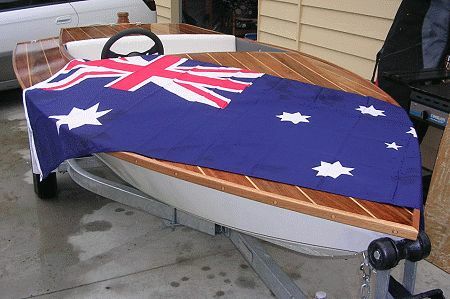 The boat is all marine ply with Tassie Oak (basically Gum trees) being used for the frames. The deck is made of 4mm thick planks of Tasmanian Blackwood with 6mm X 4mm Celery Top Pine strips in between. I have updated my web site of the boat showing some photos from on the water and on the land. I have also moved the web site to a new and larger home. It is now at http://www.ozsoft.com.au/splinter/default.htm . 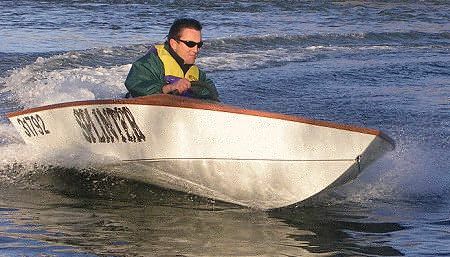 Also attached are some of the best photos of the finished boat that we have. I have lots of photos of the building process if anyone is interested. The best of them are one the web site.